A point'n'click series of dramatic puzzles about survival and moral dilemmas. Six unique scenarios built around difficult moral dilemmas all with different possible solutions. Empathy System uses player actions to affect the great team’s well being and attitude. 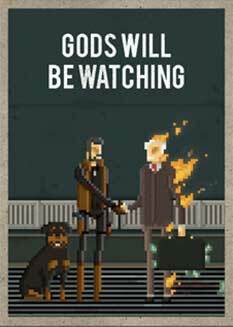 ​Gods Will Be Watching is a game about hard decisions and moral dilemmas in order to survive. A series of dramatic puzzles where not only the mathematic outcome counts but also the ethical approach to the problem. There’s also no good or evil, just decisions, with only you as the judge of your actions. Is eating your friends the best way to stay alive, or just the easier? …a memorable work of considerable emotional heft. God Will Be Watching is a fantasy that captures a very real, disturbing hint of apocalyptic reality.